My futile attempts to attain perfection as I kept track of a jam-packed calendar of kids’ activities, meetings, and doctors’ appointments. I would spend many early mornings filling out forms, checking homework, cleaning the house and trying to maintain a sense of normalcy. Needless to say, the first half of 2015 was rough for me. Checking in on Facebook from the surgical waiting room at Jefferson Hospital or from the intensive cardiac care unit at the Hospital of the University of Pennsylvania was not possible. I was so overwhelmed by both experiences and I couldn’t bear to read the comments which would surely follow. Have you ever noticed how sometimes support is incredibly wonderful and other times it can be suffocating? I wasn’t prepared for either scenario. So I kept it all inside–which turned out not to be a good idea either. As a result of all of the above and some other underlying factors, I also kept the following aspect of my life off of Facebook – I was diagnosed with depression and anxiety. My symptoms included shaking and crying often for no particular reason, total exhaustion, out of the blue panic attacks, stomach issues, and an overall loss of appetite. I would literally stare at a small, plastic container of Greek yogurt willing myself to eat the whole thing—often leaving half of it untouched. And I LOVE Greek yogurt! What started this? I don’t know the exact cause because there isn’t one thing I can pin it on. However, my fears of not getting everything done and done well may have been what ultimately did me in. Ever since grade school, I’ve been known as the conscientious and dependable one. My teachers even wrote it on my report cards. People rely on those qualities in me every day and I thrive on that. I give 110% to everything I do with passion and determination, but I guess I just ran out of steam. My grandmother used to say do everything, wear everything, and enjoy everything in the best of health. Boy, she was so right! I am happy to report that everyone is healthy–including me–and we are all enjoying life again. I continue to bounce back thanks to the love and support from my amazing family and closest friends as well as some excellent doctors and a little medication. 🙂 So why am I sharing this with you now? This blog is called Life Without A Manual for a good reason. Sometimes life throws you curve balls that hit you square in the head. Very often you don’t see it coming. You become so dizzy, confused, and upset that you think you can’t find a way out–until eventually you do find a way out. THERE IS NO MANUAL. But there are people around you who love you who can pick you back up, be there in your time of need, get you through the hard days, and help you move forward. To those people who were there for me, I am sending you a heartfelt thank you. You all know who you are. There is always a way out and I hope that sharing some of my story will help others who may be suffering in silence. Actually, I am ready. I’m ready for my house to be filled with piles of camp laundry to wash, dry and put away. (Did I really just say that?) I’m ready to wake up to the smiles of my children first thing in the morning. I’m ready for someone to call me Mom again. Camp Heisman has been swell. Scott and I have reconnected and spent lots of quality time together. Long summer walks and great conversations have been a key part of our staycation. Day trips, dinners out, working hard at our jobs, and hanging out with good friends was a big part of our “camp” activities. Meanwhile, our children enjoyed a wonderful 3 1/2 weeks at overnight camp connecting with old friends, making new ones, pushing themselves past their comfort zones, solving their own problems, and spreading their wings. On Sunday, they will come home and the rest of our summer will begin. 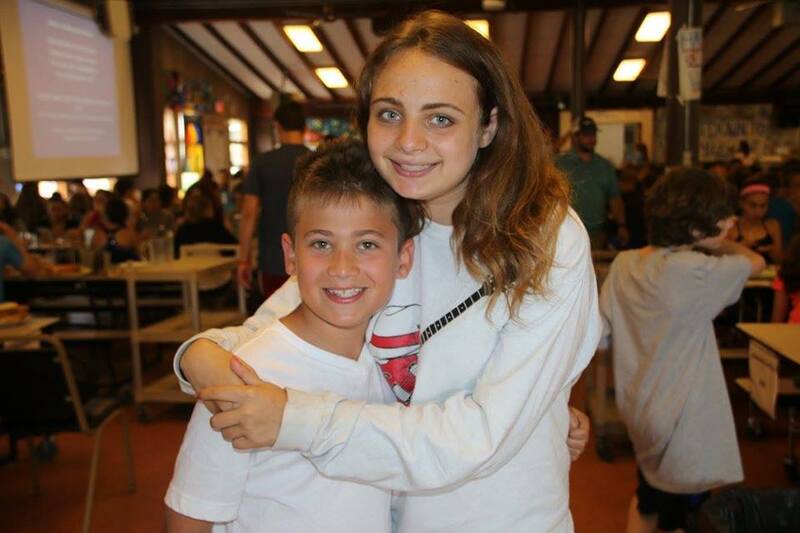 Jenna will take her place as a CIT at day camp while Andrew joins another bunk of friends. We will put Tube Night back on the calendar on Wednesdays and head over to our local swim club on a regular basis. And an amazing family vacation is only weeks away. Some of our friends send their kids to overnight camp for both sessions and they encourage us to do the same. I applaud them for continuing to support their children as they spread their wings, but it is not my plan to follow suit. While I love to watch the kids grow as people, I also want them to keep planting some roots at home. Soon enough, college will take them away from us for much longer periods of time. Vacations with their friends will be the priority for them as they continue to fly away from our nest and start their own lives. So, we have decided to send them for one session of camp only (as long as we can afford it!). But then we want them home with us–while they are still legally required to be there. 🙂 Meanwhile, bring on the laundry, the camp stories, the sleepovers, the smiles, the constant shout outs demanding something from me. I’m ready for them to come home. The other day, I was on my knees in the middle of DSW in a slightly panicked state of mind. I was searching for my Fitbit Flex which must have fallen off my wrist only 20 minutes ago. I didn’t realize it was missing until I came home from shoe shopping–proudly carrying 3 cute new pairs of sandals. I changed out of my work clothes, looked down and saw my bare wrist. The Fitbit was gone. I rummaged through my bags and checked the floor of my car thoroughly. It was definitely not there. I didn’t even say goodbye to my family as I grabbed my keys, backed out of the driveway and made my way back to DSW. I retraced my steps through the parking lot praying someone didn’t run it over. I was so mad at myself. I just spent $100 on that damn thing and I lost it. Besides, we were at the start of a beautiful friendship. I threw open the door to DSW and asked the first 3 people I saw if anyone turned in a Fitbit. The saleswoman didn’t think so and immediately put out an APB on my device to the other workers in the store. Soon, everyone was glancing down to help me look. I said another little prayer that no one already walked away with it. I held out hope as I walked through the aisles of sandals, shoes, and sneakers. Ten minutes later, I found it right near the black wedged sandals I decided against buying. It must have slipped off my wrist as I was contemplating which pair to buy. The search was called off, people went back to their lives and the salespeople congratulated me. Relieved, I attached it back to my wrist and went home. This is the life of a woman obsessed with her Fitbit. For some reason, this lightweight, plastic bracelet has really got a hold on me. It motivates me to park my car a little further from the front door of the office. It reminds me to take the stairs instead of the elevator. When I’m a good girl, the Fitbit rewards me with badges I can post on Facebook. It even encourages me to go to bed a little earlier so as to get the right amount of REM sleep. And since it is equipped with a built in alarm, its gentle vibrations against my skin wake me up every morning. Hmm…maybe I’m getting a little too close to my Fitbit. Is there a support group out there for me? I’ll even walk there if it helps me acquire more steps for the day. Anyway…. At the end of every day, we check in with each other to see how many steps I took, how many miles I traveled, how many calories I burned off, and how many minutes of exercise I can take credit for. Today, I proudly walked 10,653 steps which equals 4.3 miles, and 1,912 calories burned. I also spent 36 minutes exercising. It was a good day for us. Losing it forever would have been hard to get over, but I would have managed somehow without it. Right now, I just prefer not to. Eight years ago, Scott & I went on a Royal Caribbean cruise to celebrate our 10th wedding anniversary. We left the kids with their grandparents for the week while we frolicked and played on the high seas. We laid out on the pool deck drinking cocktails, drove jet skis in Haiti, climbed Dunn’s River Falls in Jamaica, swam with the stingrays in Grand Cayman, and toured Cozumel on segways. Throughout the entire vacation away from the chaos at home, we were reminded how much we really enjoy each other’s company and why we got married in the first place. It was like falling in love all over again. This summer, we don’t need to go away to have a good time. We are experiencing a “staycation” while both kids attend overnight camp in the Poconos. We are taking nice walks at night, having great conversations during the day, and staying in bed a little longer in the mornings. Our relaxing agenda consists of to do items like hanging out with friends, going out to dinner, and discovering the wonders of Netflix. By the way, I don’t know why it took us so long to take advantage of this plethora of great TV at our fingertips! Anyway, we purposely made no big plans for these weeks so we could just “be.” The first six months of this year were rocky to say the least with several family illnesses–including my own battle with anxiety accompanied by some crippling panic attacks. (More on that later.) Thankfully everyone, including myself, is on the mend, but 2015 has been the year of the unexpected. To kickstart the 2nd half of the year, I am referring to our staycation affectionately as “Camp Heisman.” It is a new beginning. A fun little haven of adult conversation and activities in the comforts of our own home. Hot showers and good food are standard. Clothing is optional. (Sorry Mom & Dad). And while we miss our kids so much, we know they needed a break too. We all deserve this little hiatus which is probably why I do not feel at all guilty about our current situation. In a little more than two weeks, we will be one big happy family under one roof again. Things will pick up right where they left off. Jenna and I will watch and analyze episodes of The Bachelorette while Andrew catches up on American Ninja Warriors. Tube Night at the pool will go back on the calendar. Clothes and kid clutter will give the house that “lived in” look again. Conversations about camp, friends, school and life in general will come back to the minivan–where it is frankly a little too quiet for me these days. Soon enough, my life will be exactly like this again (click here). For now, my plan is to lay low and take it easy while it lasts. Maybe we will go to a movie during the week or out to dinner. Perhaps, we will jump in the car for a day trip or two. And I should probably finish my novel for book club–or actually start it. Most importantly, I am grateful to be able to give our kids some wings, take a break from it all and enjoy this time together as husband and wife.